Review: The Case of the Missing Marquess by Nancy Springer is the first book in the Enola Holmes mystery series. The main character is Enola Holmes, a 14 year old girl, who has two brothers. One of them is the great detective Sherlock Holmes. When Enola Holmes discovers her mother’s strange disappearance she quickly sets out to find her. Her mother has sometimes gone a few days without being home, but comes back, but when Enola’s mother goes missing on her birthday setting out wearing the oddest clothes, she knows something isn’t right. She escapes being sent off to boarding school and immediately begins to search for her mother. She disguises herself as a widow and travels to the city of London. While on the journey Enola comes upon The Case of the Missing Marquess, Lord Tewksbury. She and the run away Lord Tewksbury, the heir to a throne, are kidnapped by two men. They manage to quickly flee their captors. Enola then leaves Lord Tewksbury to hunt for her long lost mother which nobody seems to care about except for her. This is a book with a lot of action packed scenes. Although it can sometimes be confusing with its strong vocabulary, The Case of the Missing Marquess is a fun and thrilling adventure for readers. Whenever Enola gets into a situation such as when she is kidnapped by two murderous villains, it’s like you can never put your book down! Nancy Springer vividly describes the whole story so it feels like your right in the room with all the characters. I strongly recommend this book because you’ll just want to keep reading more. It will be a very good book if you’re in need for an exciting well written story. This is a very good book for the start of the Enola Holmes mystery series. When you read the book you’ll want to read all the others! I would recommend this book for anyone over the age of 12. Those younger that might have a hard time understanding it, because of the book’s extensive vocabulary. Nancy Springer is a two time award winner for the Edgar Award for Best Young Adult Mystery. Review written by Lauren, Grade 6. Date of review: January 2009.
Review: Imagine being a young teenager and trying to survive on your own in the gritty streets of London where burglars and kidnappers roam among you. That is the story that Nancy Springer tells about Enola Holmes in The Case of the Missing Marquess, which is her first book of her three book series. The story takes place in London, England during August, 1888. It is a dark emotional tale of mystery and family turmoil. The main character is Enola Holmes. She is a 14 year old girl who is distraught because her mother has vanished on poor Enola’s birthday. Enola has fled from home because she was about to be sent off to a boarding school by her older brother Mycroft, since he is now her guardian. 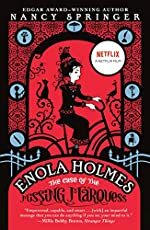 As her journey begins Enola Holmes is dedicated to finding her mother, but her journey takes a twist when she gets involved with The Case of the Missing Marquess of Basilwether. She stumbles upon the whereabouts of the young Marquess and gets kidnapped along with him. She then has to escape from the villains and recue the Marquess, while keeping her brothers clueless about where she is and still having hopes of finding her mother. Most of the time The Case of the Missing Marquess is full of action and very thrilling. The way Enola escaped from her ride to boarding school was very exciting and vividly told. You could feel the adrenalin rushing through her as she escaped on her bike. There were also several unexpected twists in the story like when her identity was discovered and she had to quickly flee to avoid her family finding her or when she was taken captive by those who were after the Marquess. Nancy Springer helps the story along when she shares with us what’s going through Enola’s head. It helps us follow her thoughts and feelings. Other times the book is mildly boring and confusing. It’s boring when Enola first arrives in the new village and she spends a long time describing what she sees and when the reader is given background about the ciphers. It’s confusing and hard to follow how she solves some of the ciphers and clues that her mother left her. It was also a bit bewildering as to why the villains kidnapped Enola. There didn’t seem to be a big benefit for them. Overall, I enjoyed this book and will be looking forward to reading the next two books in the series. I would recommend this book to others if they enjoy mystery books with unexpected twists. It is no surprise that another great mystery series was written by Nancy Springer since she is a two time recipient of the Edgar Award for Best Young Adult Mystery. Review written by Marisa, Grade 6. Date of review: October 2008.
Review: Are you looking for an easy reader mystery book? The Case of the Missing Marquess is a children’s mystery by Nancy Springer. It is the first of three books in the “Enola Holmes Mystery Series”. This story takes place in England in 1880 about a 14 year old girl named Enola. Enola’s name spelled backwards is Alone, which fits her. Being the mistake and disgrace of the family, Enola was often alone and grew very independent. It wouldn’t have been such a big deal when her mother left one night, but minor clues like her mother’s wardrobe left Enola uneasy. Following her instinct, Enola informs her brothers, the successful detectives, Mycroft and Sherlock Holmes. The siblings meet in London for a long overdue reunion. After brief conversation, Mycroft claims he has been giving money to their mother. Where did all that money go? Mycroft also insists Enola be sent to boarding school. Enola decides to take the journey to her mother alone. Much to Enola’s advantage, she finds a hidden message from her mom. Following her mother’s clues, Enola uncovers money left in picture frames. Her mother had left the money Mycroft had sent for Enola. Disguised in her mother’s clothes, Enola takes off on a bike. She receives news that the Marquess of Basilwether had been kidnapped. She escapes to London only to be kidnapped herself. Coincidently, Enola finds herself captive on a boat with the Marquess! What happens to them? Will they escape? Will Enola find her mother? This mystery was a great and adventure filled story. Written well, you feel as if you are in Enola’s shoes. Her feelings become real and understandable to the reader. This page turner leaves you hanging and on the edge of your seat. I would give The Case of the Missing Marquess a “thumbs up”. I along with many other readers cannot wait to get my hands on the sequel. Review written by Mary, Grade 8. Date of review: April 2009.
Review: Action, adventure, suspense, these words all describe The Case of the Missing Marquess by Nancy Springer. It is the first of three novels in the Enola Holmes series. The main character, Enola Holmes, is a 14-year-old girl, and the younger sister of renowned detective, Sherlock Holmes. When Enola Holmes realizes her mother has strangely gone missing, she embarks on a mission to go out and find her. She knows that her mother sometimes leaves for a few days, but never this long. When Enola's mother is still not back on her birthday, she tries to find out more. She is finally able to escape while being sent off to boarding school by her brothers and begins to search for her mother. Disguised as a widow, she journeys to the city of London. On the way, Enola stumbles upon the case of the young missing Marquess of Basilwether also known as Lord Tewksbury. When she arrives in London, she and the missing Marquess are kidnapped. They manage to escape the men. Enola then leaves Lord Tewksbury to again try to find her missing mother. This relatively short mystery has many intense chapters. It is puzzling at points, but never very confusing. I recommend this book to kids ages 10 through 14. Nancy Springer provides great images of what the characters are doing and where they are. It really helps you to picture it in your mind. I recommend this book because it is always interesting and not a very long read. I give it two thumbs up. This book has not been made into a movie, but the author, Nancy Springer, has won the Edgar Award for Best Young Adult Mystery twice. Review written by McKenzie, Grade 8. Date of review: May 2009.
Review: Do you like mysteries and adventures? Then this is the book for you. The title of the story is The Case of the Missing Marquess, by Nancy Springer. It is the first book of the series and the main character is Enola Homes, a 14-year-old girl that will not give up at any point in the story. In the beginning of the book, Enola and her mom weren’t very close to each other. They loved each other but kept out the other’s business. Suddenly, at Enola’s 14th birthday, her mom went away and didn’t come back to celebrate it. Enola thought she had something important keeping her busy, but when she didn’t come back, she got worried. So, when her brothers, the legendary Sherlock and Mycroft Homes, came to investigate, she runs off in an effort to find her mother. Using the gifts her mom gave her, she finds money and clues leading Enola to her. She disguises herself as a widow and a plain, middle class girl to escape the dangers of London, and stop her brothers from taking her to boarding school. She meets up with another runaway child and they help each other in a getaway from the criminals. Enola’s eyes are opened for the first time about the world around her. Enola is strong minded and stubborn. She always tried her hardest in a situation. She was faced with many things, but she thought through it and came out on top. And, with her book of ciphers and messages on flower paintings, she would crack codes and hidden messages and find important things her mom left her. I would recommend this book to children that are between the ages of 7-10. It was a very exciting book but sometimes, like in the beginning, it was slow. Once you read past Chapter 5, it got better. I can’t say it was a middle school level book; it was a little young for me. But it was still exciting and kept you guessing. It was well written, but at some times I got confused and re-read it. It was sequential and pretty easy to follow. In conclusion, this book is exciting and adventure filled. It tells a story about what a 14-year-old girl in London with its many dangers trying to find her mom. She uses disguises and the money she finds through the ciphers her mom left for her to embark on her perilous journey. Review written by Renee, Grade 7. Date of review: April 2009.
Review: The Case of the Missing Marquess is the first book of the series by Nancy Springer. Some of the characters in this book are familiar, Sherlock Holmes and his brother Mycroft Holmes. The author brings in their younger sister Enola, who is the main character, and Lord Tewksbury, who is a young runaway. Have you ever wondered why you never see your brothers? Or on your birthday, your mom isn’t there that day? Or the next day or the next? Well that is exactly what Enola has to put up with. The character, Enola (which she painfully knows is "alone" spelled backwards), is 14 and lives in London. On her birthday her mother mysteriously disappears. Enola looks everywhere, but all she finds is her mother’s money in mysterious places using her mother’s gift. So Enola runs away from home, disguised as a widow, to search London for her mother. On the way she runs into two mean men who try to kill her and a boy her age that has also run away. The plot is mysterious, and the author was very creative about pulling characters in. This book is very mysterious in a lot of ways. One way is that Enola has never seen her brothers which are famous detectives, Mycroft and Sherlock Holmes. The book is also surprising. One way the book is surprising is that Mycroft and Sherlock Holmes called their own mother foolish! Something also surprising is that when Enola’s mother ran away she just left a birthday gift and money for Enola, not even a “good-bye” note or anything. I also thought that the author had some very good descriptive details. The author also added the characters in the story very nicely, like Lord Tewksbury and the mean men. A weird thing about the book is that some words in the book are very hard to understand. I sometimes had to look in the dictionary. So I think this book would fit higher-level readers perfectly. This author is creative and intelligent. She earned honors from the Mystery Writers of America. She also is a two time Edgar Award winning author. This book leaves a lot of questions hanging, but one important question is “why didn’t Enola’s mother bring Enola with her?” That question makes you want to read the second book! This book is a book any avid reader would want to read! Review written by Sammy, Grade 6. Date of review: October 2008.